I am beyond thrilled to share with you another work of heart, a free printable teacher planner! Calling all teachers! Ever wished you had a system to get organized in school? 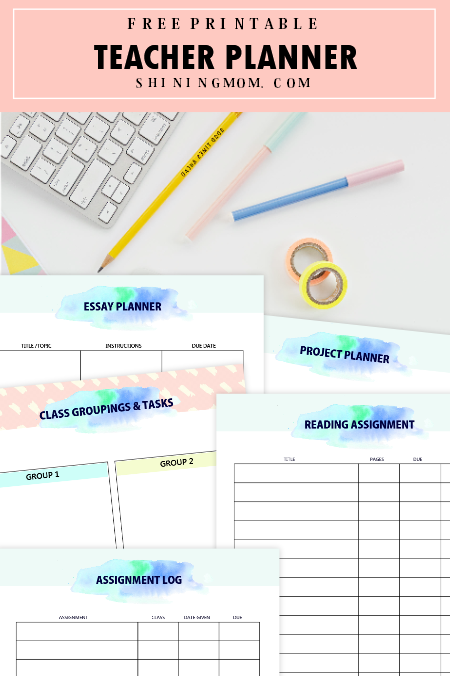 Here’s a work of heart that I am so sure you’re going to love – a complete set of organizing printables to help you stay on top of your school work! We can see how you selflessly pour your love and time for your students. And for that, we thank you. This amazing classroom organizer is for you! 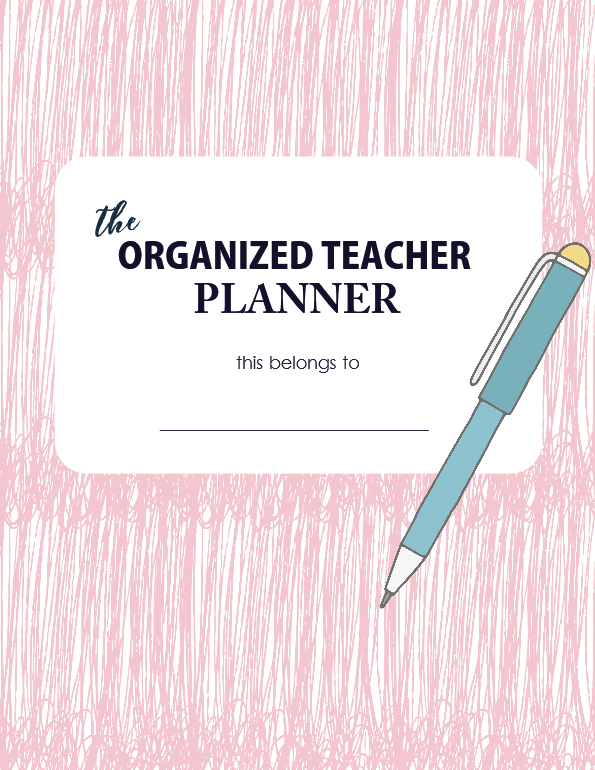 Introducing… “The Organized Teacher Planner”- your perfect companion to get organized this school year!! I understand that your job is never a walk in the park. It’s way beyond being just a profession. It’s a vocation that you pour so much hardwork and love into. This is why, I created this free printable teacher planner. I designed it to ease your work a little by helping you get organized. And do you know what my dream for this planner is? I dream that it reaches and blesses the hands of thousands of amazing educators in the world– that includes you! 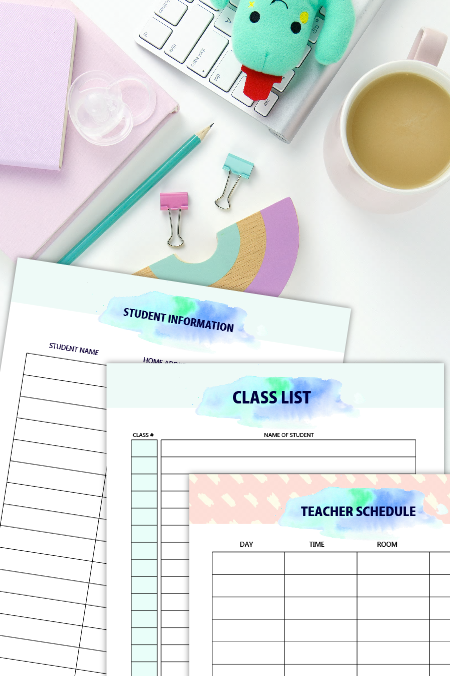 Keep your cool in school with this amazing free printable teacher planner! 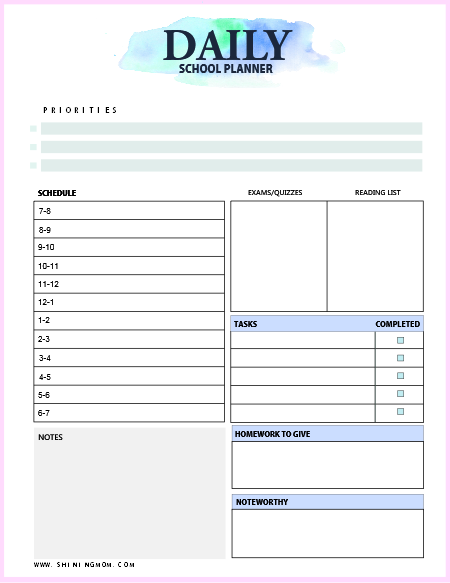 The Free Printable Teacher Planner: 45 Excellent Organizers for School! If you’ve been following the blog, you probably know by now that I spent 8 years of my life being a teacher. Yes, I landed on a teaching job in a prestigious international school right after graduation from college. I am happy that I was able to share that chapter of my life with the kids before I resigned from my job to work from home, to look after my kids. I may ALWAYS be tired back then but there was never a single day that I didn’t feel my purpose as a teacher. I always felt blessed knowing that I did not just teach a subject, I molded young souls, and hopefully, touched hearts. Ahhh, I know every teacher shares the same joy! But ask any teacher, paperwork in school is a daunting task! There’s a mountain’s worth of exams or essays to be checked, and there are never-ending school activities that need sorting. This is why, I thought of stepping in by sharing another free printable teacher planner. This planner includes most of the basic organizers a teacher needs to successfully and blissfully manage her class. Don’t miss a copy! This planner has 45 amazing printable organizing sheets! School stickers, note pads and more!! 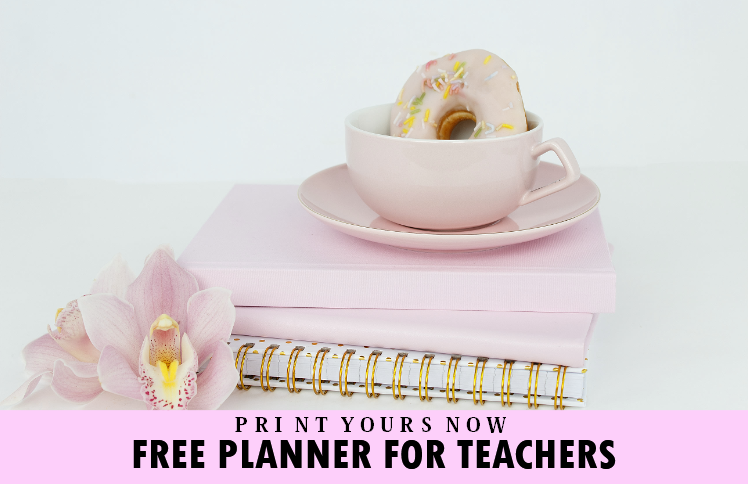 What’s Inside the Free Printable Teacher Planner? We’re now entering to the more exciting part by virtually “opening” the planner! Here, allow me to initiate this quick tour. Shall we start with the very first page you’ll see? It’s time to reflect before the kids go back to school. Ho will you make the new school year an amazing one for your students? Think about it, and write down how you can best impact a child’s life. Now let’s flip through the next pages. Here you’ll find amazing school organizers which includes student information sheets, class lists and more! 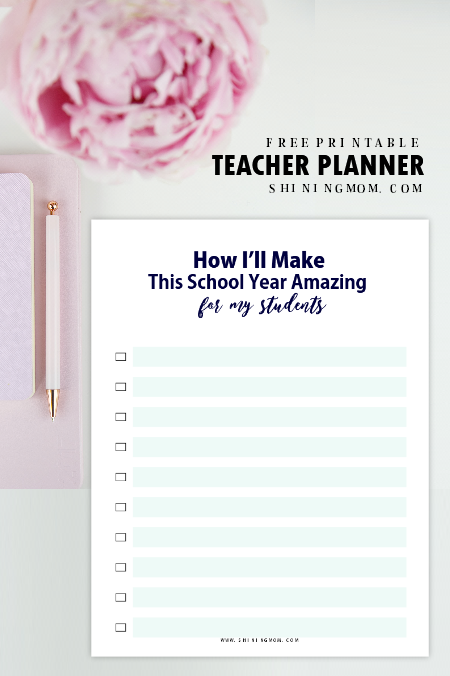 Really, school organizing is made easy using this free printable teacher planner. Additionally, I’ve also included templates for the students that you can print out and share to ease their learning. To name a few, you’ll get templates for essay and project planning. And to teach them to get organized, perhaps you can print the graphic organizers I have here such as the assignment log and reading list sheets? All these pages and a whole lot more! Just to let you know, I have also added school planner stickers and other fun stuff in your download. Excited to finally have your own copy? I am just as excited to share it with you! Get the Free Planner for Teachers! Join the Shining Mom mailing list >HERE< to receive the file sent straight to your inbox instantly! Shining Mom has almost 30,000 happy newsletter subscribers that receive weekly freebie updates from the blog. You can unsubscribe from the list anytime! 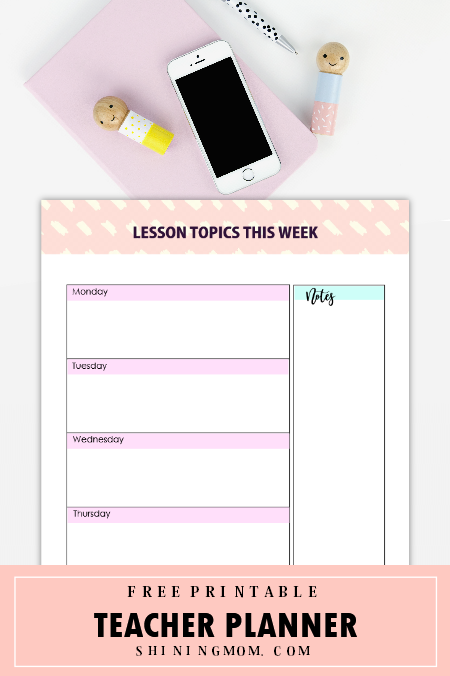 Please note that this free printable teacher planner is designed for printing in US standard Letter-size paper (8.5″ x 11″). You may also print it in A4, just be sure to adjust your printer setting to fit the pages. Share this Teacher Planner Freebie on Pinterest! Be part of this blog’s growth by sharing this free printable teacher planner for other teachers to see. Please pin the image below in Pinterest. You can help make this post trend! More School Organizing Freebies for You! May this school yer your best and most organized ever! See you again soon! « FREE Beautiful July Calendars: Organize Your Schedule! Hi! Yes, it’s within the post. Thank you for this amazing planner! I have been looking for a planner that will work for me. This is it! Thank you so much for sharing! !